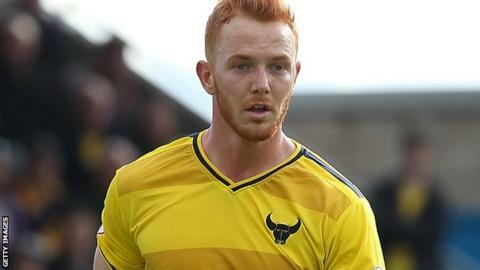 Ryan Taylor scored a brace as Oxford United thrashed nine-man Stevenage. Taylor opened the scoring before Chris Whelpdale levelled with a 30-yard chip. Boro keeper Jesse Joronen saved Liam Sercombe's penalty after Dean Parrett's foul, but could not save Sercombe's second spot-kick, as Jamie McCombe was sent off for hauling Danny Hylton down. Alex MacDonald notched the third before Michael Tonge saw red for a two-footed challenge, and Taylor and Kemar Roofe completed the rout with further goals. Match ends, Stevenage 1, Oxford United 5. Second Half ends, Stevenage 1, Oxford United 5. Attempt missed. John Lundstram (Oxford United) left footed shot from outside the box misses to the right. Attempt saved. Adriel Jared George (Oxford United) right footed shot from outside the box is saved in the bottom right corner. Attempt missed. Pat Hoban (Oxford United) right footed shot from the right side of the six yard box is just a bit too high. Attempt missed. George Baldock (Oxford United) right footed shot from outside the box misses to the right. Attempt blocked. Danny Hylton (Oxford United) right footed shot from the centre of the box is blocked. Corner, Oxford United. Conceded by Tom Pett. Attempt blocked. Liam Sercombe (Oxford United) right footed shot from the centre of the box is blocked. Attempt missed. George Baldock (Oxford United) right footed shot from outside the box is just a bit too high. Attempt saved. Pat Hoban (Oxford United) right footed shot from a difficult angle on the right is saved in the centre of the goal. Substitution, Oxford United. Adriel Jared George replaces Kemar Roofe. Substitution, Stevenage. Ben Kennedy replaces Dean Parrett. Goal! Stevenage 1, Oxford United 5. Kemar Roofe (Oxford United) left footed shot from outside the box to the top left corner. Assisted by Callum O'Dowda. Goal! Stevenage 1, Oxford United 4. Ryan Taylor (Oxford United) header from the centre of the box to the top right corner. Assisted by George Baldock. Attempt saved. Kemar Roofe (Oxford United) left footed shot from the centre of the box is saved in the bottom right corner. Michael Tonge (Stevenage) is shown the red card for violent conduct. Goal! Stevenage 1, Oxford United 3. Alexander MacDonald (Oxford United) left footed shot from the centre of the box to the bottom left corner. Assisted by George Baldock. Attempt missed. Alexander MacDonald (Oxford United) left footed shot from the centre of the box misses to the left. Hand ball by Chris Whelpdale (Stevenage). Attempt missed. Fraser Franks (Stevenage) header from the centre of the box is high and wide to the right. Corner, Stevenage. Conceded by Sam Slocombe. Attempt saved. Tom Pett (Stevenage) right footed shot from outside the box is saved in the top centre of the goal. Corner, Oxford United. Conceded by Chris Whelpdale. Attempt saved. Danny Hylton (Oxford United) header from the centre of the box is saved in the centre of the goal. Corner, Oxford United. Conceded by Mark Hughes. Attempt saved. Armand Gnanduillet (Stevenage) right footed shot from the right side of the box is saved in the top centre of the goal. Corner, Stevenage. Conceded by Ryan Taylor.